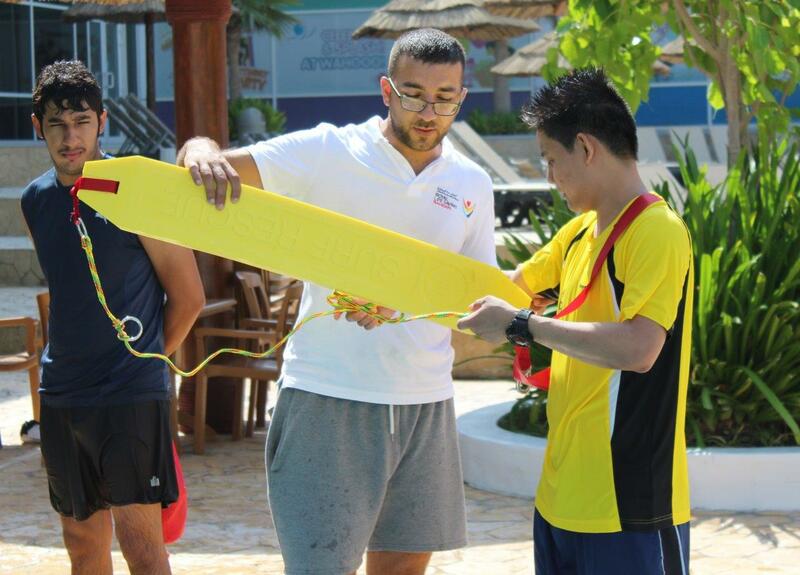 Royal Life Saving Bahrain recently held the first International Life Saving (ILS) recognized Pool Lifeguard Course. The 4-day training (15 to 18 October 2017), witnessed the participation of 10 professional lifeguards from various hotels in the Kingdom, in addition to swimming instructors and water park staff. On this occasion, Sam Rahman, Safety Services Executive at Royal Life Saving Bahrain said “we are so excited to host our first internationally recognised pool lifeguard course, that is an integral part of the RLSB Water Safety strategy which we launched last week with the goals to promote safe enjoyment of water, build cohesive communities, enable economic development and save lives.” He added “this is also our first step towards ensuring that all lifeguards working in Bahrain are trained and certified in line with international best practice. Such consistency in lifeguard training when combined with the right safety equipment and operations procedures, will give swimmers in Bahrain the confidence of being safe at pools. I would like to call upon all hotels and water parks in Bahrain to get their lifeguards professionally trained and certified and ready to save lives”. At the conclusion of the training course, all successful participants received a Pool Lifeguard Certificate valid for 1 year; they will then be required to attend an update course to renew their certification enabling them to continue working as lifeguards in Bahrain. Royal Life Saving Bahrain is working closely with the Bahrain Tourism and Exhibition Authority and the Bahrain Drowning Prevention Committee to finetune the new safety guidelines for all hotels, water parks, and tourist establishments with swimming pools and/or access to the beach. In November, Royal Life Saving Bahrain will host the first Internationally recognized beach lifeguard training course. For more details, interested parties may email RLSB ([email protected]) or call (36615661). It is worth noting that Royal Life Saving Bahrain (RLSB) is a charitable organization launched in October 2016 with the mission to promote safe enjoyment of recreation in water, build cohesive communities, enable economic development and save lives. Royal Life Saving Bahrain is a member and recognized by the International Life Saving Federation (ILS), the world authority for drowning prevention, lifesaving and lifesaving sport. All lifeguarding qualifications made available in Bahrain through RLSB will be recognized internationally by the ILS.